Botanist claims to overturn established ocean phytoplankton theory – cites global warming as a concern for new theory | Wott's Up With That? 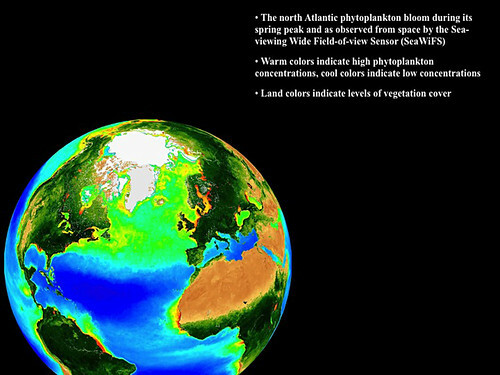 “Botanist claims to overturn established ocean phytoplankton theory – cites global warming as a concern for new theory“. Whew. Anthony Watts can sleep again. Global warming has been disproved! Again. Somehow. In a paper by an Oregon State University botanist (Abandoning Sverdrup’s critical depth hypothesis on phytoplankton blooms). So Anthony instinctively copies and pastes the press release. Eurekalert has a press release about Dr. Behrenfeld’s research, which suggests that phytoplankton blooms occur at a greater range of depths and seasonal than previously recognized. Well that settles it! The critical depth hypothesis would suggest that a warmer climate would increase ocean productivity. Behrenfeld’s new hypothesis suggests the opposite. This entry was posted in I wouldn't have seen it if I didn't believe it, Sweeping Statements, There's a Study! and tagged Press Release by Ben. Bookmark the permalink. WUWT A VEHICLE……….This is an article involving summertime stratification (warm water on top of cold water), winter storm mixing, and a new theory about phytoplankton growth. Climate change (mentioned only in the last paragraph of the paper) and attendant reduced winter mixing exist only as GIVENs, against which the phytoplankton theories are compared. So his chosen vehicle is an unhelpful irrelevance to the question he asks about the other side of the issue: whether AGW would lead to more storms or more stratification. Presumably his intent is to bring out the creativity in his commenters.